Weighty Matters: The Canadian Medical Association sells Echinacea for pediatric flu prevention! I'm not sure how I found myself clicking over there, but one day last week I landed up on the webpage for Canadian Health Magazine - a magazine published by the Canadian Medical Association (CMA). I can't remember what I was looking for, but I sure do remember what I found. I found a series of banner advertisements by a company named A. Vogel. Head over to their webpage and you'll find they're all about, "phytotherapy and homeopathy". Now before you get all in a huff, I've got nothing against any form of therapy - so long as the intervention you're promoting actually has an evidence-base. Prove it works and I'll happily endorse it, but if you can't, at best its prescription is premature and hopeful and at worst, risky and fraudulent. So what did the banner ads on the Canadian Medical Association website want to sell me and what wording did they use to try to do it? Echinaforce Junior - Get your kid's immune system ready! Echinaforce Junior - To prevent or relieve cold and flu. Echniaforce Junior - Clinically Proven. 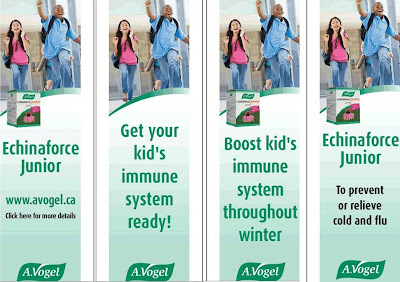 Echniaforce Junior - Boost kid's immune system throughout winter. I'll get to the details behind the claims in a minute but first this - I noticed that there was an "advertising" link on Canadian Health Magazine's site so I clicked it and learned that with over 30.3 readers per copy Canadian Health Magazine is the most read magazine in Canada and 77% of readers said the content of Canadian Health Magazine was more credible because of CMA ownership. Those are some truly impressive statistics! "deliver the most credible and current health news and research information to Canada’s health consumers"
So back to Echinaforce Junior. Echniaforce Junior is simply Echniacea. Looking at medline, since 1950 there have been 24 papers published that discuss the therapeutic use of Echniacea and many of these are simply commentaries and not in fact therapeutic trials. Given the advertisement's claims that Echniaforce Junior would help protect your children by preventing influenza, and given the state of alarm due to H1N1, I decided to look for studies that suggested echinacea had an impact on flu frequency, duration or severity. Guess what? There were none. The closest I could find was a paper published in what I would consider a dubious journal already, the Journal of Alternative & Complementary Medicine, but putting my instinctual skepticism aside I read the paper and learned that the researchers only investigated symptoms suggestive of either cold or flu and did not in fact test subjects to determine if they were suffering from influenza in the first place. So to summarize the vast dearth of research, there is not a single published study looking at the use of Echinacea for the prevention or treatment of influenza, yet of course that's what the advertisement tacitly endorsed by the Canadian Medical Association, in a periodical where 77% of readers report having more trust due to CMA ownership, quite explicitly states Echniacea does. Regarding jacking up my child's immune system? Combining searches for child, immune and Echinacea turned up a big goose egg. So in short there's nothing in the medical literature to suggest that Echinaforce Junior could deliver on any of its claims. Clearly, if there is an editorial policy for vetting CMA owned Canadian Health Magazine advertisements it's not being followed as it's inconceivable to me that a Canadian Medical Association advertising policy would allow for the advertisement of unproven products that prey on medical fears. Sadly what is wholly conceivable to me is that they have no advertising policies whatsoever and hence are in fact contributing to healthcare fraud. Worse yet is the Canadian Medical Association's potential contribution to pediatric mortality as parents who decide to choose Echinaforce Junior (in part perhaps due to their increased trust of its association with the Canadian Medical Association whose mission they know is to deliver "the most credible health news" to Canada's health consumers) over vaccination for flu prevention certainly have no medical evidence upon which to support their choice. I've copied this post to the President of the CMA and the editor of Canadian Health Magazine and I sincerely hope the offending ads are immediately removed from their site. Will keep you posted as to responses. UPDATE: The CMA is looking into the ad in question (among a few others) and certainly agree that their responsibility to ensure the validity of the claims of their advertisers is greater than that of the average company. FINAL UPDATE: The offending ads have been removed! Thanks CMA!